Become a Knight as you defeat mystical creatures and help Hercules save ancient Greece! In a burst of anger and jealousy, Hera has cursed Hercules. You are handpicked by Athena to save him. Monster Boars, Stone Giants, Greek Phalanx and hundreds of villains secretly supported by Hera are waiting to undermine you. The fate of Hercules rests on your shoulders. Battle along Gods like Zeus, Athena, Hades, Poseidon, Apollo, Aphrodite, and many more, as they help you along your journey. Donate to your temple to level up your Gods for even better buffs in battle. Be vigilant against the hordes of enemies on your way to help Hercules. Strategically crush enemies with your powerful elemental abilities. Assemble an indestructible team that suits your battle style and be ready to unleash your special ability to defeat your enemies. Unlock and train your chief commander and five knights, each with their unique power elements – ice, fire, thunder, lightning and earth. Forge items with the help of the smithing God Hephaestus. Use Fusion Stones to transform them into devastating weapons and unleash brutal damage. Dominate the Arena. Fast track your way up to the leaderboards and define yourself with glorious gold & silver medallions.Keep track and participate in PvP events for special rewards. 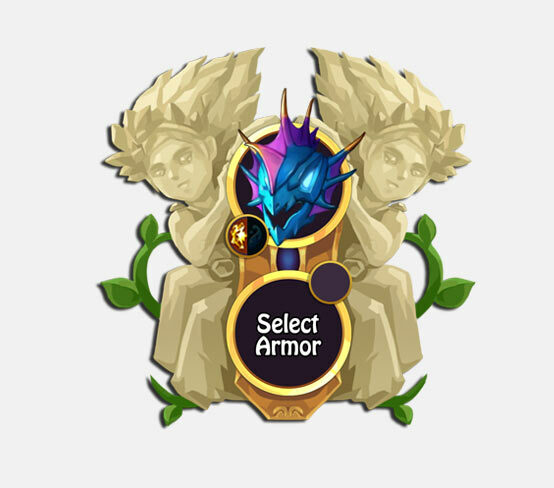 Unlock new armor as you rank up.